Sylvia was born February 16, 1926 in London, England to Leonard (Pop) and Hannah (Nan) Lee, and peacefully passed away on April 18, 2015. She met her husband Frank Valenzuela during his stationing in England during WWII. 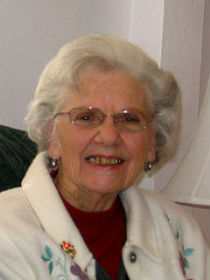 After a whirlwind courtship with her GI, they were married on Valentine’s Day 1946. After the war, they settled with his family in Santa Barbara. In a few years Sylvia’s parents followed her to the States. Her husband opened a Moving and Storage business, and Sylvia worked for many years as the office manager. She did take some time off to have 2 children, Roland and Duane. Once Frank sold the company, he joined Sambo’s and after completing their program, ran several restaurants from LA to New York. As usual, Sylvia jumped right in and became a waitress and hostess working right alongside of him. After Frank retired, Sylvia began another career in banking working for 3 different banks over a period of 15 years. When her husband passed away in 1990, she continued to work for several years before finally retiring. Even as her health failed her in recent years, she could still vividly tell stories of Jolly old England, as well as tales of the war as they took cover during the many air raids that they faced. She always had her dry English wit and that special twinkle in her eyes when she was pulling your leg. She is survived by her son Roland, his wife Sue of Santa Barbara and their two children Shalene and her husband Jeff of Missoula MT, and son Paul of Santa Barbara and also her son Duane of El Dorado Hills, CA and his daughter Sydney who is currently attending UC Santa Cruz. Graveside services to be held on April 28 at 11 AM at the Santa Barbara Cemetery. The family requests that in lieu of flowers please make a donation to one of the many organizations trying to fight and find cures for Diabetes or Parkinson’s.